Back in June, Abacus Data asked Canadians how they would vote in a federal election if Justin Trudeau was leader of the Liberal Party. We asked this question after the our usual ballot question early on in the survey. We found that if Trudeau was Liberal leader, 27% of respondents would vote Conservative compared to 26% who said they would vote Liberal. 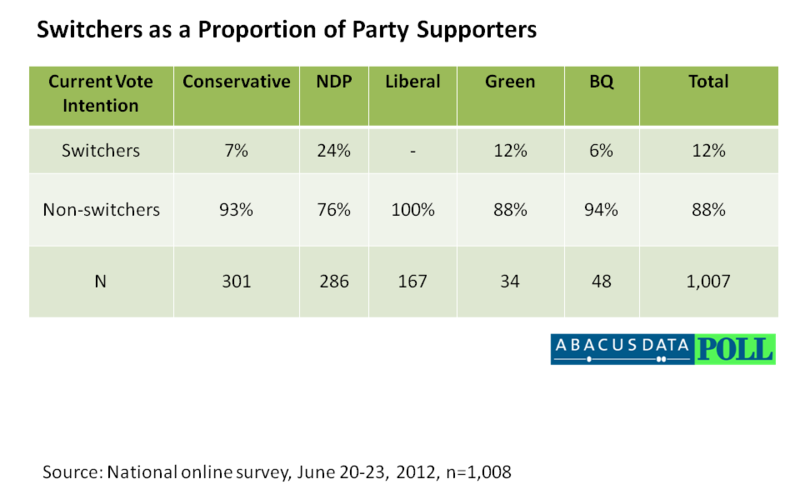 20% would vote NDP while 8% said they would vote for another party and 18% said they were unsure. This was substantially different than the results of our traditional vote question which found the Conservatives and NDP tied with 31% each, 18% for the Liberals, and 11% saying they were undecided. So I wondered who are these Trudeau switchers? Those who said they would vote NDP under the current situation but would vote Liberal if Trudeau was leader. 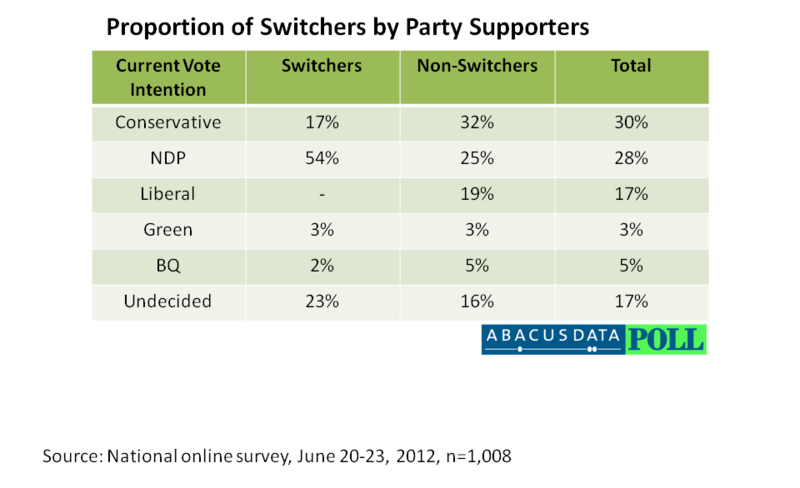 First of all, Trudeau switchers in our survey represented 12% of all survey respondents. In other words almost one in five Canadians we surveyed said they would vote Liberal if Trudeau was leader after only minutes earlier they saying they would vote for a party other than the Liberal Party. If you are Tom Mulcair – stop reading here because there is very little good news going forward. Among Trudeau Switchers, 54% of them (yes, half of them) said they would vote NDP in our earlier question (we are comparing the pure vote intention question which does not include leaners). 17% of them are Conservative Party supporters who previously preferred the Tories and said they would switch to vote Liberal with Trudeau at the helm, while switchers also include 3% and 2% of Green and BQ supporters. Also striking from the numbers if the age distribution. Today I wrote about Trudeau as the Millennial candidate in the Sun newspapers. He certainly has an opportunity to connect with younger Canadians unlike any leader before him, perhaps except his dad. Trudeau switchers are not all younger Canadians. In fact, they represent only a small minority of those who switchers. 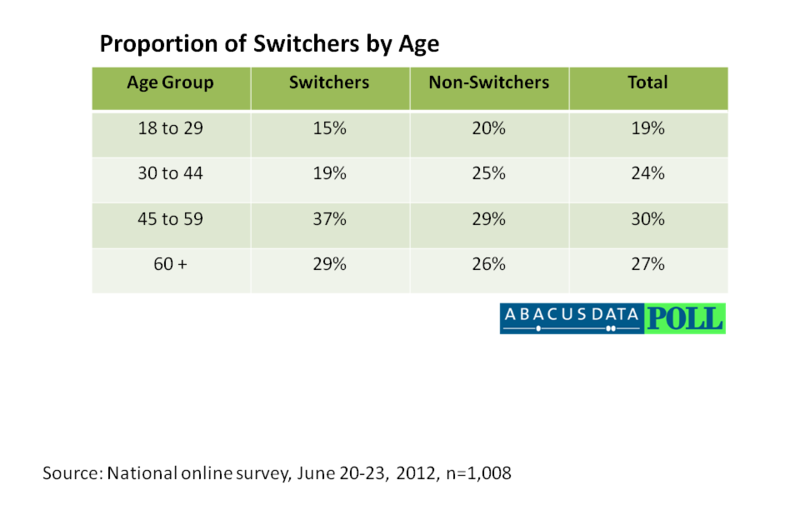 Among switchers, 15% are under 30 years old, 19% are 30 to 44 years old, 37% are 45 to 59 years old, while 29% are 60 and over. Trudeau switchers actually skew older. So the Trudeau threat to both the NDP and the Tories is too fold. 2. He could expand the political market by bringing in new voters who have been apathetic in the past. In marketing terms, that is a real threat to the dominance of the Tories and the insurgent New Democrats. If Tom Mulcair does not concede that Trudeau is a threat publicly, New Democrats across the country better hope he is behind the scenes.